For information about using Sprinter, see the Sprinter PAM, Sprinter Data Sheet and Help Center. Certain versions of software accessible here may contain branding from Hewlett-Packard Company (now HP Inc.) and Hewlett Packard Enterprise Company. As of September 1, 2017, the software is now offered by Micro Focus, a separately owned and operated company. Any reference to the HP and Hewlett Packard Enterprise/HPE marks is historical in nature, and the HP and Hewlett Packard Enterprise/HPE marks are the property of their respective owners. Beginning with version 14.50, Sprinter underwent a complete facelift, giving it a modern look with a user-friendly interface. For details, see Sprinter at a Glance. For version 14.52: Automatically populates defects with Application module and Feature. For version 14.51: Sprinter can connect to Octane server through SSO (Single Sign On). Ability to launch Sprinter from within Octane. 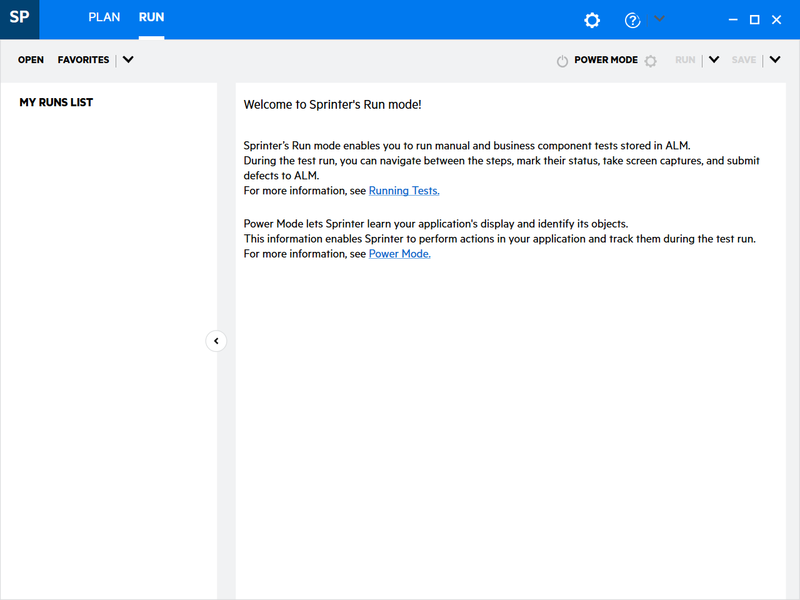 For details, see Run and edit manual tests in Sprinter. Support for markdown in test steps. For details, see Manual text syntax in the Octane Help. When creating a defect, Sprinter populates the defect details with additional information such as Detected in Release, Environment, Detected by, and so forth. For version 14.51: Support for Terminal Emulator technology (Attachmate Extra! X-treme). For details, see Add/Edit Application Dialog Box. For version 14.51: Ability to recover the last unfinished run session for tests that were run in ALM and have a No Run or Not Completed status. For version 14.51: New entry in the Run mode's Favorites: Last Sessions. This allows you to recreate the last session upon opening Sprinter. Ability to recover the last unfinished run session for tests that were run in ALM and have a No Run or Not Completed status.. New entry in the Run mode's Favorites: Last Sessions. This allows you to recreate the last session upon opening Sprinter. For version 14.50, Sprinter has undergone a complete facelift, giving it a modern look with a user-friendly interface. For details, see Sprinter at a Glance. Integration with Mobile Center 2.80. Ability to set the quality and size of all images including Storyboard, Annotation, and Screenshot images. For details, see the Run Settings Pane. Integration with Mobile Center 2.60 and Early Access multi-project feature. Enhanced Storyboard image mechanism: All of the storyboard images will always be visible in the run results and the exported Word file. For details, see the Run Settings Pane. ALM Defect submission enhancement: Invalid link in the defect description is plain text and relevant screen captures are now stored as defect attachments. Significant reduction in the time required to start a test in ALM. Note: When downloading Sprinter version 12.50 for use with Application Lifecycle Management 11.52, make sure you have ALM 11.52 patch 2 or later installed.